Life has been difficult in recent times for Julie Gallagher who has a long term health condition that has prevented her from being able to stand unaided. She suffers from a long term neuropathy in her lower legs, a disease in the peripheral nerves which causes numbness or weakness. It has meant she has been unable to stand in her kitchen to make food, has struggled to get around and was having to shower sitting down. 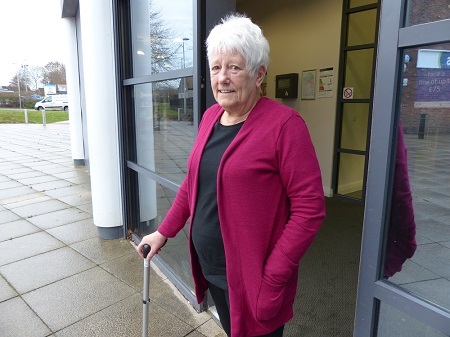 However, the start of the New Year is bringing a new start for Julie from Winsford, after she embarked on a Council-funded falls prevention course. Better Balance - Falls Prevention is run for 25 weeks by our partners Brio Leisure to help people improve their core and legs strength and balance. It implements Otago Exercise Programme (OEP), an internationally renowned and evidence based programme designed to decrease falls in older people by improving function, strength and balance. Julie said: “I have got limited feeling because of the neuropathy but it will take a long time for that to heal. Doing this course and being shown exercises to develop the strength in your core has improved the way that I get around. I feel the benefit of building the strength of my muscles. It has made a massive difference to me. Also attending the course, Sylvia Clarke of Winsford said: “I had three falls. The first one I broke my shoulder, then I broke my ankles and then the third one I broke my wrist and fingers. I used to be tripping and falling. Programme leader Tomoko Forrest from Brio Leisure said: “We use chairs as a support. We progress from the easier exercise to the harder exercise. As people’s balance and strength improves we reduce the amount of support with the chair. Councillor Louise Gittins, Cabinet Member for Communities and Wellbeing, said: “Many people struggle with maintaining their core strength as they get older. This results in people falling at home and when they are out and becoming injured. It is more difficult for elderly people to recover quickly and they often require longer periods of recovery in hospital. Jess Jeffreys, Health and Wellbeing Manager at Brio Leisure, said: “Brio are very pleased to be offering these falls prevention classes alongside our other health and wellbeing services for residents of Cheshire West and Chester. Julie added: “I am dependent on my husband. If I go anywhere I am dependent on another person to go with me. I am mentally alright but I am at risk of falling. If people like me haven’t got anyone at home to help them then they don’t get out because they are frightened of falling. To access the course, people need to be aged 65 or over and referred by either their GP or a health care professional.